Morris Home Hardware on Wellington just east of Holland is without question a neighbourhood landmark. They have battled through competition within neighbourhood, tougher economic times on the Wellington strip, and perhaps most impressively the exodus of small "ma and pa shops" to the big box stores of the suburbs. 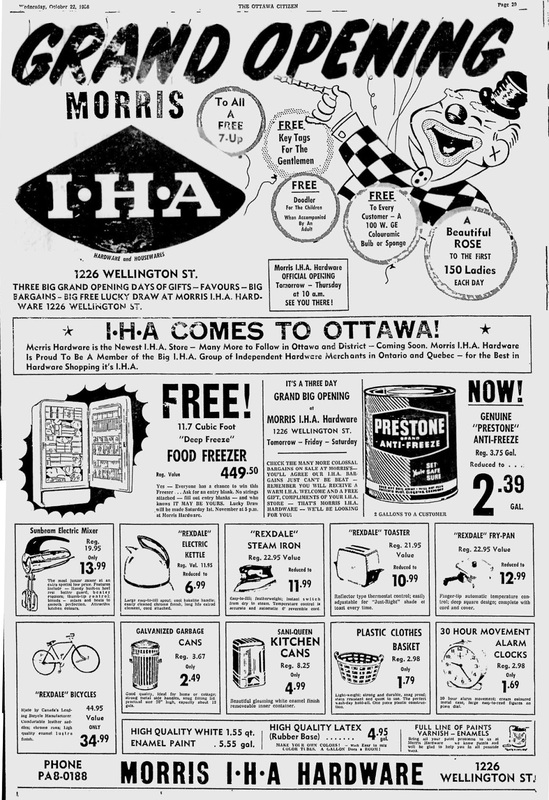 Few stores have as long a history in Ottawa, and even fewer within the borders of Kitchissippi. When you consider they've even been in the same physical store for nearly sixty years, they stand nearly alone in that category. Now a third-generation shop in the Morris family, business is strong, and its certain any hint of a closure would see a lot of people in the community battling to save it. 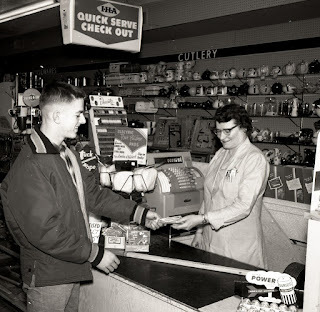 Thankfully we don't have to worry about that for now, but I thought it would be interesting to take a look back at the history of the store, which has seen Kitchissippi through many changes and development back to its beginnings in 1947. 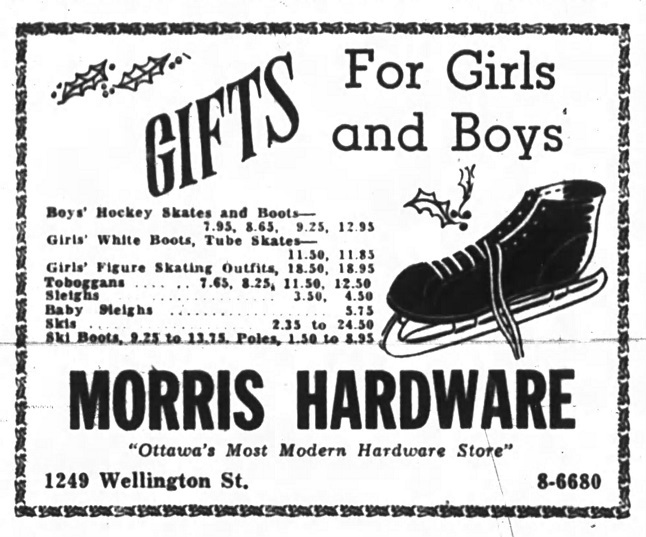 Stuart B. Morris had his first exposure to the world of hardware as manager of a store in Hamilton, Ontario for three years starting in 1922, starting when he was just 17 years old. 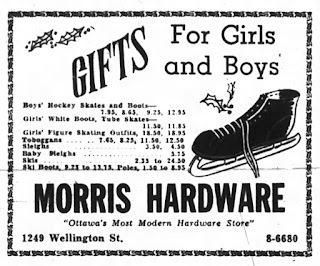 While managing the store, Morris notably played in the early days of the CFL, as a quarterback with the Hamilton Tigers football club in 1925, and Toronto Balmy Beach in 1926. He became a travelling salesman for General Steel Wares and later the Canada Paint Company, becoming manager of the Ottawa district in 1931. Morris moved in to a home nearby at 364 Holland Avenue, and must have kept his eye on the local commercial real estate market. The 1930s were a difficult time to be in business, and WWII made it only harder. 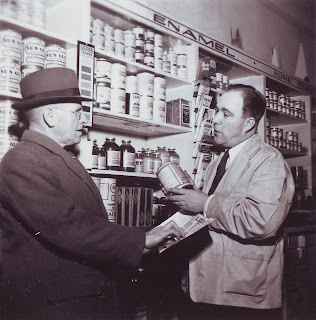 However, times became more prosperous after the conclusion of the war in 1945, and Morris saw a niche for the business in the area, particularly with his well-established connections. 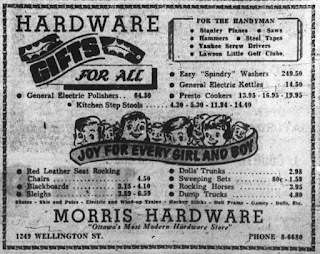 So it was in December of 1947 that Mr. Morris took out a lease in a newly constructed building on Wellington Street, and opened his own hardware store, Morris Hardware. This new building still stands in Wellington Village, just a little to the west of where Home Hardware does their business today. 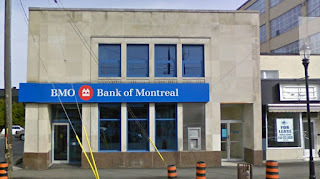 Residents of the area nowadays know it as the Bank of Montreal building, on the north side of Wellington Street just west of Holland. But in 1947, this building was known as the Haughton Building, constructed by top Ottawa lawyer W. Edward Haughton to house his practice in the upstairs office space. 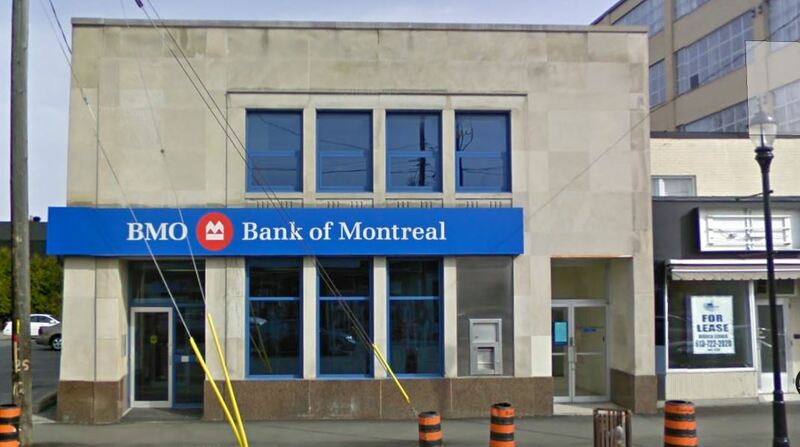 The downstairs was split into two halves, the east half occupied by the Bank of Montreal (the fourth Ottawa location the bank opened) and the west half was rented to Stuart Morris for Morris Hardware. 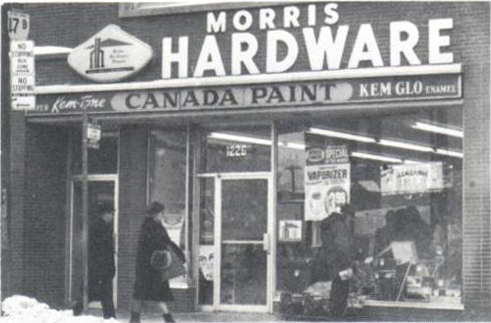 When you walk through the doors of the bank to enter the bank today, you're entering what would have been Morris Hardware in 1947! 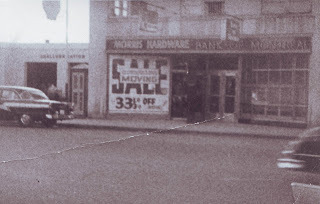 Below is a rare photo of the original Morris Hardware location, in the Bank of Montreal building on Wellington just west of Holland. The "moving sale" indicates this would be from one of the final days of operation at this spot, in the spring of 1958. Also visible is the Shell gas station (operated by Edward Joiner at the time). The gas station remained in operation until 1970, became a transmission shop briefly, and then was demolished in 1973. It has been the Bank of Montreal parking lot ever since. Bank of Montreal building. Spring of 1958. 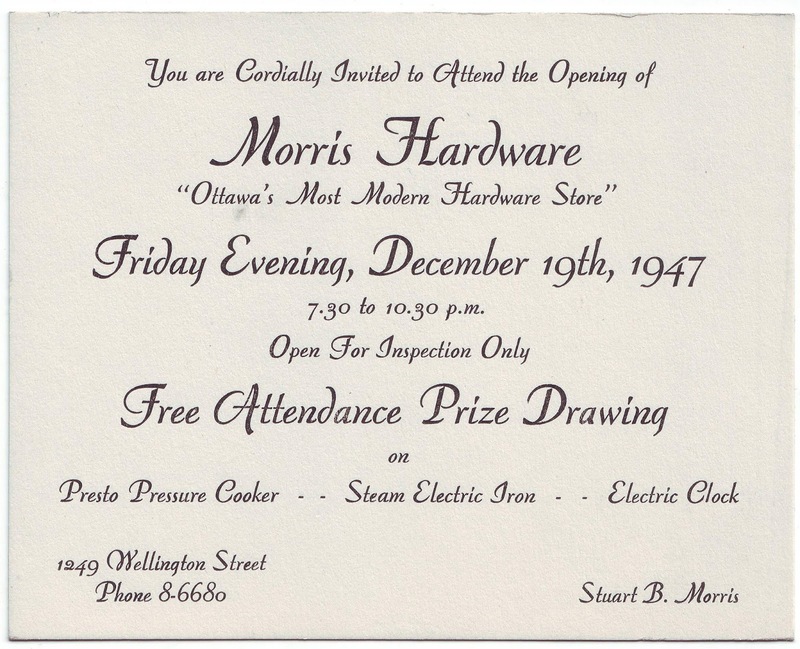 On the evening Friday December 19th, 1947, Morris Hardware had a special opening party for the public to come in and have a look from 7:30 to 10:30 p.m., with their first true day open for business the following day, Saturday December 20th. That Saturday night, Morris offered three prizes to be drawn at 5:30 for all visitors and customers on Friday and Saturday, three new novelties of the era: a Presto pressure cooker, a steam electric iron and an electric clock. The winners were drawn by Alderman George W. Pringle. 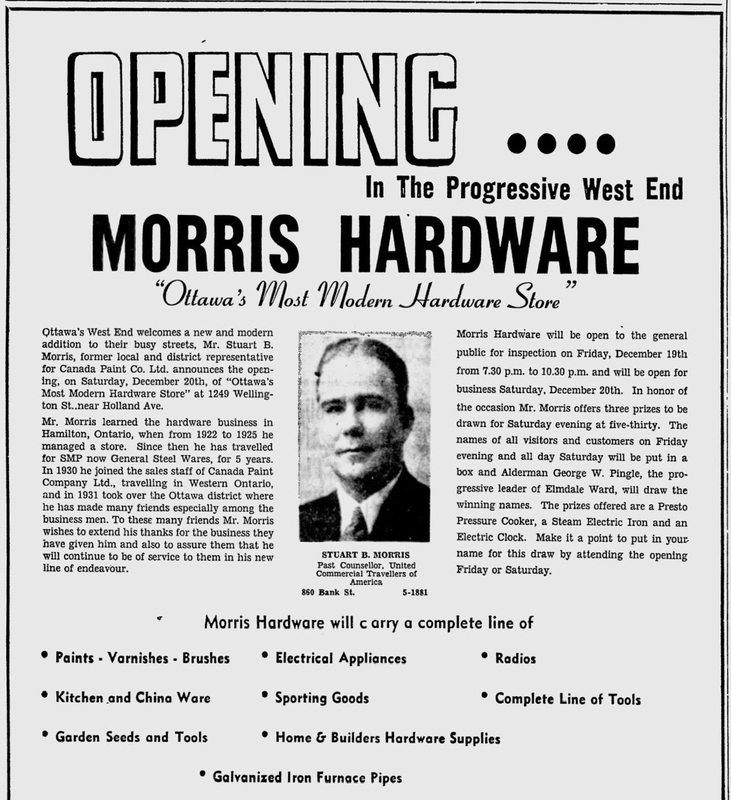 On December 19th, Morris took out a nearly-full page ad promoting the opening of the store, which included best wishes from his friends and associates such as the Canada Paint Company, Davis Garage, Ritchie Feed and Seed, J. E. Martin paint shop, and the Northern Ski Company. 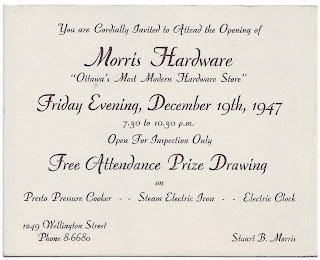 opening of the original Morris Hardware store. Formal invitation to the original opening! The first summer Morris was open for business, they fell victim as part of a ring of daring robberies committed by a group of young thieves. 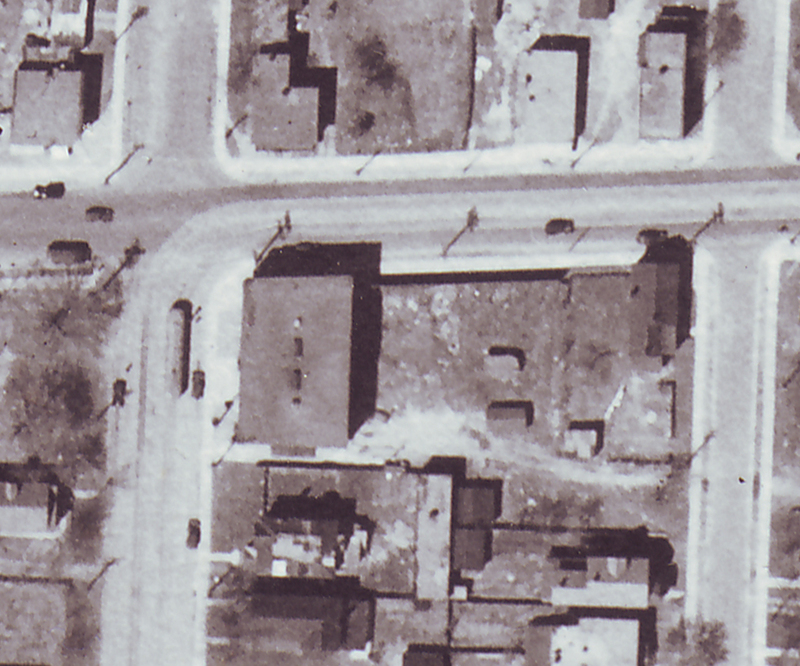 On the afternoon of August 12th, 1948, three men aged 19 and 20 robbed four stores along the Wellington stretch (Cecil Leach and Company at 712 Somerset, Lavoie's Jewelry Store at 1081 Wellington, Morris Hardware at 1249 Wellington and Waddell Hardware at 280 Richmond Road). Two of the men entered the stores, while leaving the third behind in their getaway car - a taxi cab! In May of 1956, William S. Morris graduated with honours from his three-year retail merchandising course at Ryerson Institute of Technology in Toronto. His photo was published in both local papers, and the articles mentioned that William would be returning to Ottawa to work with his father at Morris Hardware. Indeed, William had gotten his start at the age of 14 working in the shop. During this period Stuart Morris would become involved with the West Ottawa Lions Club, serve as president of the Ottawa West Business and Professional Men's Business Club, and was also a leader in the Parkdale Orchestra and Parkdale Choir. Stuart Morris was aware that his lease at 1249 Wellington Street was expiring in April of 1958. At the same time, colleague and friend Fred Towsley was operating men's clothing shop F.W. Towsley Ltd.at 1212 Wellington Street (in the east half of what is now the Caisse Populaire just on the opposite side of Hinton). 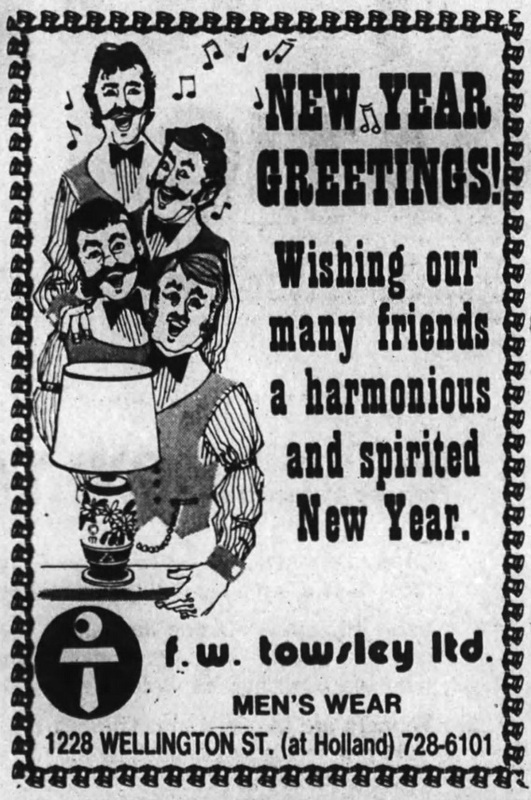 Towsley had opened the business in December of 1946. As one story goes, clothing was still scarce after WWII, and when he opened his store on the first day, he had just three suits in stock. He sold them all on that opening day. Their slogan was "good merchandise at the right price and the right quality. ", and they were a popular firm in the west end. Towsley too knew his lease was set to expire in September of 1958. But there was more to it than that. Towsley had long had his heart set on opening his business in his own building. He began to work towards that dream by first acquiring a vacant lot on Wellington in 1950, one of the last remaining open spaces on the busy commercial street. On April 20th, 1950, Towsley and his wife Marjory paid $10,500 to journalist Robert K. Carnegie for the empty lot in between the new Dominion store (now the CAA) and the Goldwyn Apartments/Joynt's Pharmacy building at the corner of Holland (now the location of The Table restaurant) - the future site of Home Hardware. Shoe Renewing Service" shop operated by Albin Cmikiewicz. Over the years, this little lot had passed through the hands of prominent Hintonburg men such as Jonas Bullman, Donald McLean, and William Joynt. The Joynts owned nearly the full block from Holland to Hinton, and had constructed the old Goldwyn Apartments at the southeast corner of Holland in 1925. 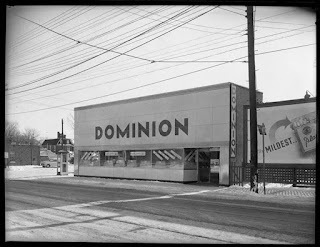 In 1946, Joynt's executors sold the two neighbouring lots to Dominion Stores Ltd. Dominion did not need both lots, and decided to keep the easterly lot, and worked out a deal with Carnegie selling him the westerly lot (the future site of Home Hardware) for $3,380. Dominion then built their store (which is now the CAA) on their remaining lot in 1948. Carnegie was a former Ottawa Bureau Chief of the Canadian Press, and one-time President of the Parliamentary Press Gallery. He was also an active real estate investor. He invested smartly; real estate absolutely boomed after WWII, particularly in the Kitchissippi area, and it is not surprising to see that just four years later, he managed to sell it to Towsley for triple the price. Towsley sat on this empty lot for over 8 years. In 1954, the transferred ownership under the name of his business (it was valued at $18,000 at that time, already nearly double even what he had paid in 1950). During this time, a large advertising billboard stood on the lot, facing Wellington Street. where the Players cigarette billboard stands in the above photo. With the end of their leases looming, and a common goal of owning their own building, the two friends Towsley and Morris, who were also both key members of the West Ottawa Lions Club and Ottawa West Business and Professional Men's Club. negotiated to build a new store together. In February of 1958, the pair incorporated as the Towsley-Morris Realty Limited, which included Fred and Marjory Towsley, and Stuart and Olive Morris as partners in the firm. With what the Citizen called "a bit of fancy financial juggling until they got the necessary cash and mortgage backing to launch the project", the plan went into action. The lot, now valued at $25,000, was put into the name of the incorporated company, and a mortgage was taken out from the Excelsior Life Insurance Company in the amount of $50,000 towards the construction of the store. 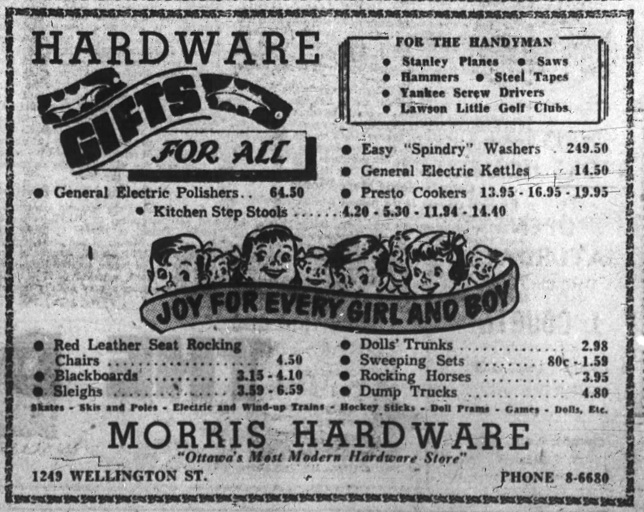 With the lease expired at 1249 Wellington in the spring, Morris Hardware moved to 1097 Wellington for the summer of 1958 while the new building was built. Incidentally, this was next-door to the original long-time location of Morris Clothing (now Morris Formalwear, which still exists further east down Wellington). No relation there, the clothing shop was operated by Morris Feldberg. Construction on the new building likely began in the early Spring of 1958. Ottawa architect Wallace Sproule designed the two-storey building which included second floor office space in the original design. Sproule also was known for designing the building at 580 Bank Street (the Works in the Glebe), the Savoy Apartments (now the Arc Hotel on Slater Street), and the old Humane Society building on Champagne Street that was torn down a few years ago. The lead general contractor on the construction of the Towsley-Morris building was H.K. Phillips, who was a well-known builder in the west end. Phillips was predominantly a home-builder (including recently built houses at 671 and 679 Island Park Drive), but occasionally also built commercial buildings (I believe one of his projects was the building containing Siam Bistro, Max's Shoe Repair and Colore Nails on Wellington near Harmer, built in 1948). In building the new Towsley-Morris building, several local sub-contractors were used, including plumbing by Marcel Carriere from Caroline Avenue, concrete blocks from the A. Bethell & Son Company on Laperriere, sand and gravel contractors Charles Burnside Ltd. at 1009 Wellington, and the heating system was supplied and installed by Potter Bros of Hinchey Avenue. The roof work was done by Sandersons on Catherine, who are also notably still in business in the same location. The building was built of fireproof concrete block and steel construction with concrete floors. The frontage was finished in Roman brick. Then-modern aluminum windows were used in construction. 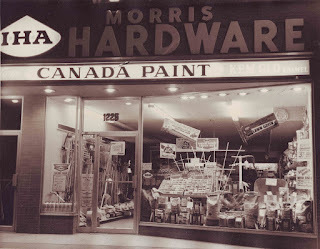 The interior of Morris Hardware was planned and designed by the Woodway Manufacturing Co. Ltd. of Georgetown, Ontario. "From tile floor to acoustic tile ceiling and peg-board walls, it is a symphony in color harmony. Thinline fluorescent ceiling lights make the store as bright as day and compliment the walls decorated in pastel shades of blue, rose, yellow and green. The main floor with its spacious aisles is well stocked with builders' hardware, plumbing and drapery supplies, paint and enamels, housewares, cutlery, giftware, electrical supplies, garden tools, brushes, cleaning supplies and carpenters' tools. In the ample basement is a wide selection of sporting goods and toys, power mowers and accessories." 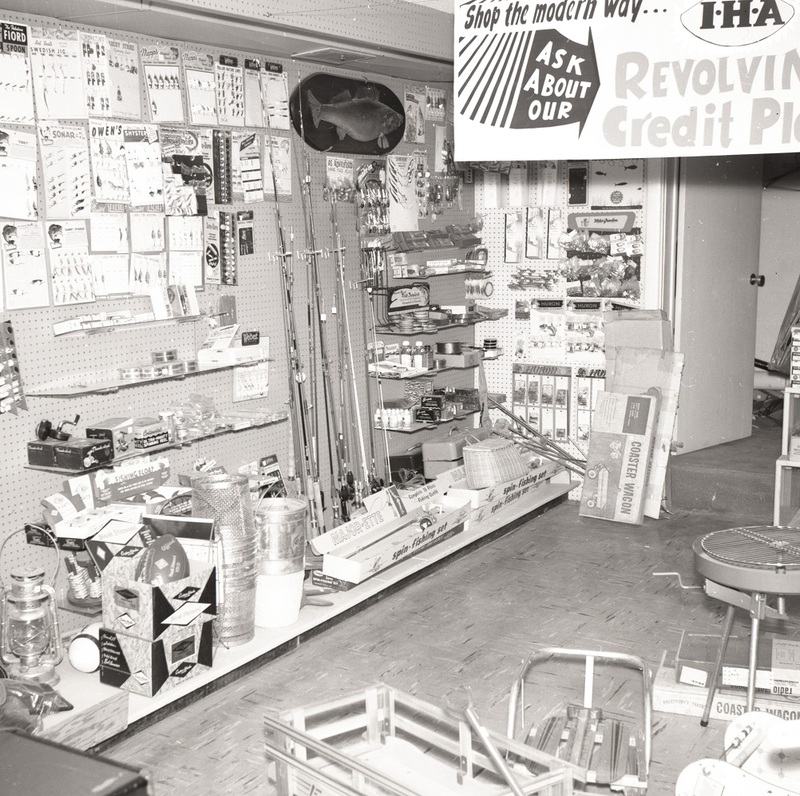 The front section of the store was devoted to toys and sporting goods. On the Towsley side, large glass windows were featured in front, with three mirrored fitting rooms at the rear, equipped with Pella folding doors. "Decor is distinctive and smartly masculine with rich oak fittings against banana yellow background." Both shops were built with equal dimensions of 24 feet by 68 feet. This was a big change for Towsley, as their original store was half the size of the new location. The Morris Hardware store was Ottawa's first store in the IHA (Independent Hardware Alliance), a group of independent merchants who dealt largely through a central supply house in Toronto. The Home Hardware association would not come for a few years yet. A staff of six worked the original store, including Stu Morris. His son Bill was Manager of the store, and looked after purchasing supplies and sporting goods sales. Also on the initial staff were Ronnie Campbell, Mrs. Harold Lee, John Plummer, Dannie Scissons and Stu Morris's eldest daughter Beverley. 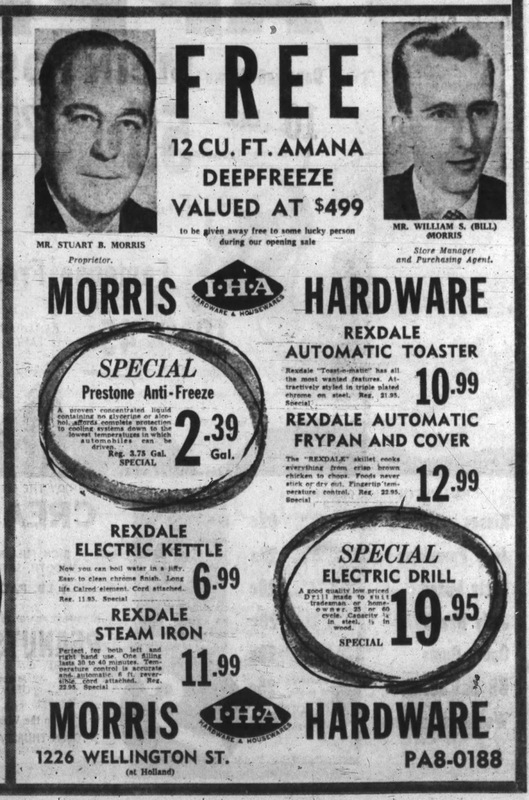 A grand opening for both shops was held on Thursday October 23rd, 1958, with the doors opening to the new building for the first time at 10 a.m. Morris offered a 12-cubic foot Amana deep freezer (valued at $449 - or $3,800 in 2016 dollars) as a door prize. The first 150 women through the doors were given long-stemmed roses, while men were given a key tag, and children a new toy called "doodlers" and balloons, while all visitors were offered a free 7-Up, and a 100 watt General Electric Colouramic bulb or sponge. 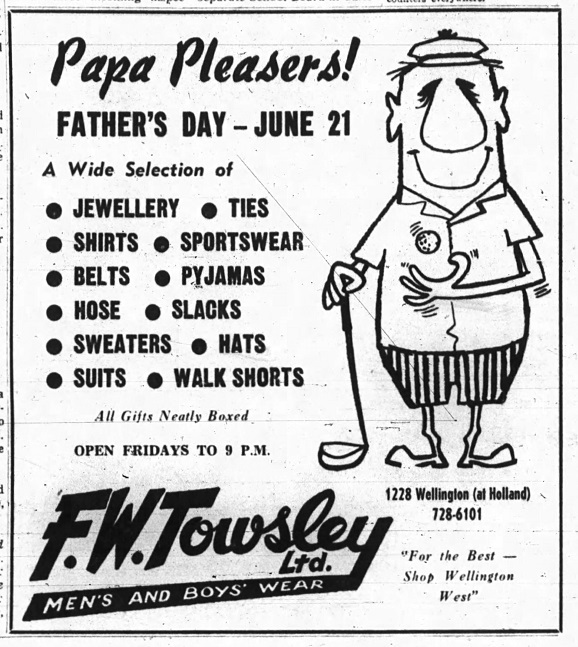 On the Towsley side, neck ties were given as a gift, as well as a $100 men's wardrobe to the person who guessed closest to the number of shirt buttons in a jar in the store window. As for the upstairs, the Empire Life Insurance Company, with local manager R. E. Parsons, had opened a branch in October as well, which was given the civic address 1226A Wellington. Empire Life would remain in the building for 15 years, departing in 1973. Later occupants would include Centurion Security and Investigations, Planned Parenthood, Coleman's School of Electrolysis, Operation Dismantle, Joan Holmes Associates, and Ottawa Fit. 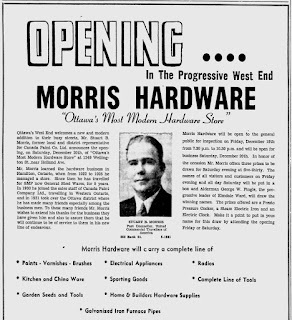 At the time of opening, there were still quite a few other hardware shops in the neighbourhood - Menard's and Bedard's in Hintonburg, not to mention Higman's across the street at Huron (now Thyme and Again). 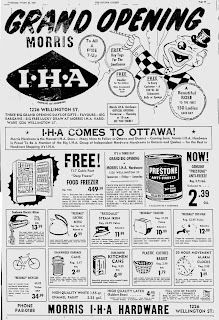 Further west in Westboro you had Heath's, Waddell's, Moore's, Green's, Cooper's and Dover's, plus Canadian Tire just west of Island Park. 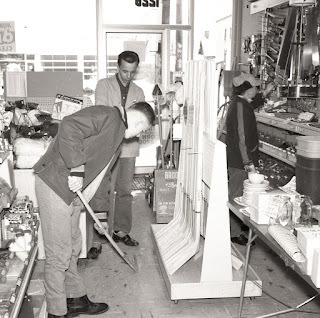 So it was a competitive era in Kitchissippi when it came to hardware. A few of these would last until the early 70's, and Dover's lasted the longest of the independents (though they were known more for their sporting goods), with Canadian Tire surviving until about ten years ago. Morris has outlived them all. Photographs of the grand opening do exist, in the vaults of the City of Ottawa Archives, taken by the Ottawa Citizen's photographer (due to severe deterioration, they are being stored in a special freezer and cannot be accessed). Unfortunately the Citizen never published any of the photos, perhaps owing to a major Ottawa event which occurred just two days after the opening which took over local news coverage: the famous explosion of the Jackson Building on Bank Street. 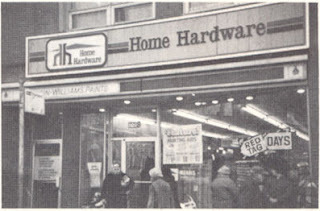 In 1963, Home Hardware was incorporated when a group of independent hardware dealers across Ontario met to discuss options to compete with the influx of the new large chain stores (such as Kmart, Woolco and Zellers) who could take advantage of strong purchasing power to offer discounts to customers. An estimated 1,000 local hardware stores closed between 1955 and 1965 because of these chains. Those independent shops who wanted to fight this shift in the industry decided to band together, to pool their buying power. 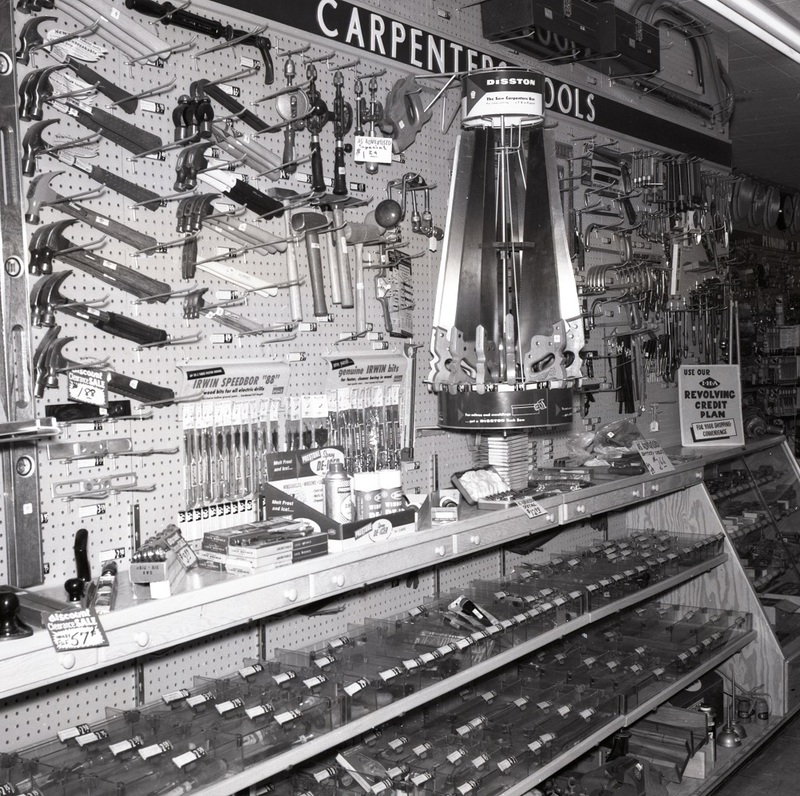 Meetings were held in early 1963 to develop a plan, and the group decided to purchase Hollinger Hardware in St Jacobs, Ontario, a shop which dated back to the 1880s, and had recently expanded its warehouses. The group then incorporated as Hollinger Hardware Limited in the fall of 1963, and all 122 participating dealers purchased a maximum of 15 $100 shares apiece. The new enterprise began in January of 1964 with just a single half-ton Ford pickup truck for deliveries. 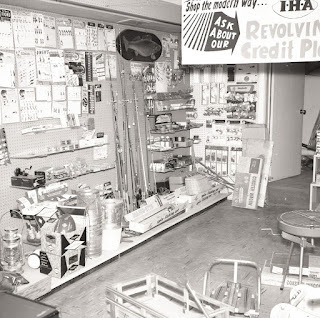 The initiative grew in 1965 when Hollinger and three other Canadian dealer-owned hardware wholesalers joined together to form a 'super-wholesaler', United Hardware Wholesales Ltd, a high volume buyer with the added advantages of promotion and inventory control. The group also adopted the new name of "Home Hardware" in early 1965 as well, and the participating dealers, including Morris Hardware, changed their logos and store names. Hardware on Elgin and their branch in Westgate Mall). 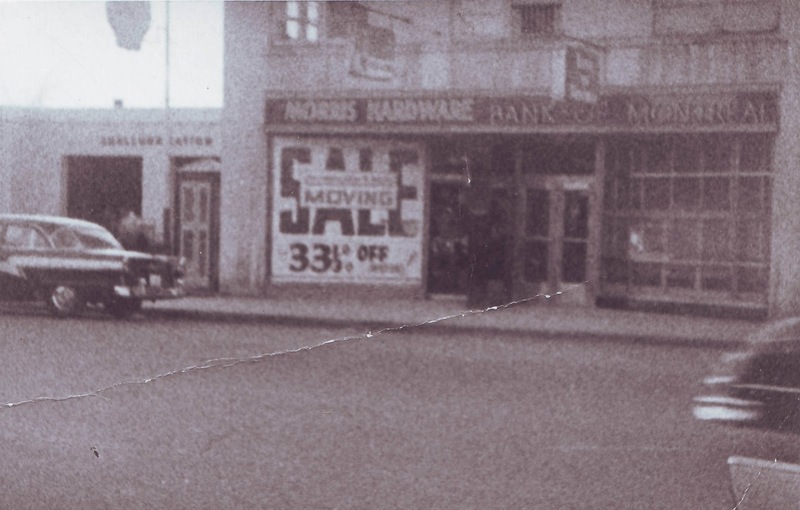 Below is a photo of the storefront of Morris Hardware from about 1969. Notice the bus stop and no-stopping zone. Some things never change. 1969 was also a key year for the business in that a second location was opened in the Britannia Plaza at just east of where Richmond and Carling intersect. By the late 70s this location had moved to Stittsville Main Street, where they remained in operation until January of 2007. Morris also briefly opened a shop in Richmond as well. Between 1980-1981, Towsley had to close the business. Fred and Marjory Towsley would retire to Florida after a long, successful career on Wellington Street. 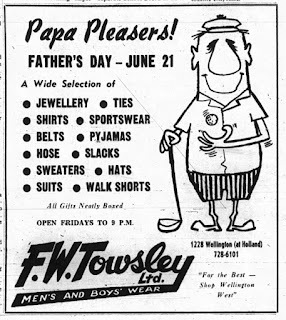 Nephew Lyall Towsley recalls the business fondly, and noted that his uncle Fred had begun his working life as a paper-maker with the EB Eddy Company, but likely didn't enjoy the work, and instead found a job as a salesman at the large Henry Mack's clothing store at Rideau and Sussex. He clearly fell in love with the role, learning the trade from some of Ottawa's top salesmen, and found the confidence to open his own store in 1946 where he remained in business for over thirty years. Mr. Towsley referred to the shop as a "haberdashery" a term which has sadly become quite underused today! Meanwhile, Home Hardware was keen to take over the full building, and acquired not only the mortgage and ownership rights to the full building, but also the remains of Towsley's stock at the time of their closure. Mike Morris remembers that Home Hardware was selling suits for about six weeks after the takeover. They took down the wall between the stores, and simply doubled up their space, without performing any significant renovations. Mike did recount that it took about ten years for the City to approve their renovation permits, which they finally were able to do in 1996. 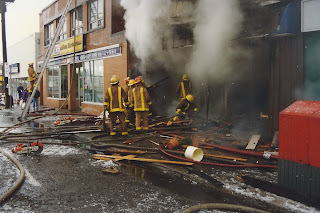 Home Hardware received a scare on Tuesday December 10th, 1996 when a major fire broke out in the old Goldwyn Apartments building next door, which burned the entire structure including Joynt's Pharmacy and the original Carlo's Pizza. 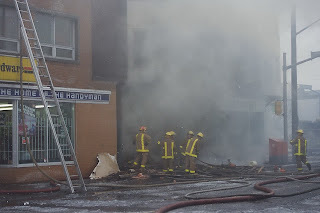 Luckily, the Home Hardware was saved, but you can see from the photos below just how close it was. 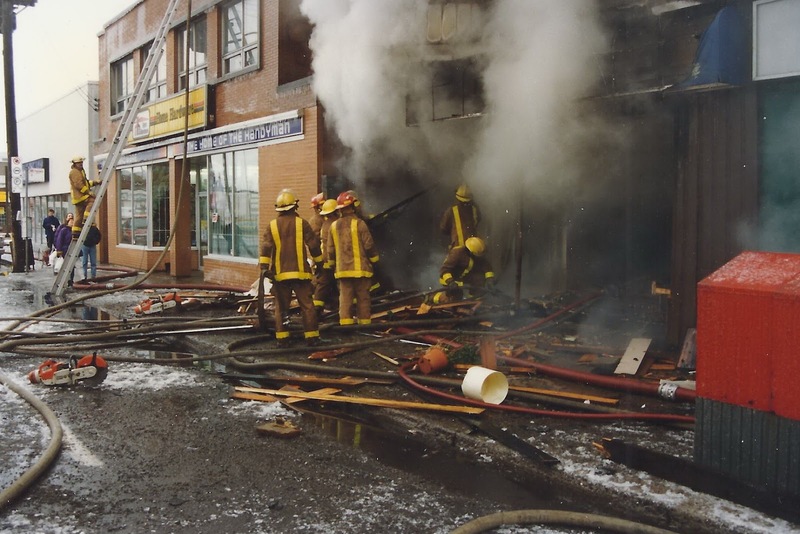 Mike Morris attributes Home Hardware being saved to a heroic fireman who saw that the collapse of the building next door was imminent, and rushed to the top of the building and pushed the wall inwards, rather than allowing it to fall on top of Home Hardware. Mike never got his name, but is obviously still appreciative to this day for the efforts of that fireman. He also pointed out that his grandfather wisely had the building constructed with a double wall on the west side, figuring that there may be a fire in the apartment building someday. Mike spent the morning of the fire rushing in and out of the basement clearing the drains to avoid the basement from flooding over from water. 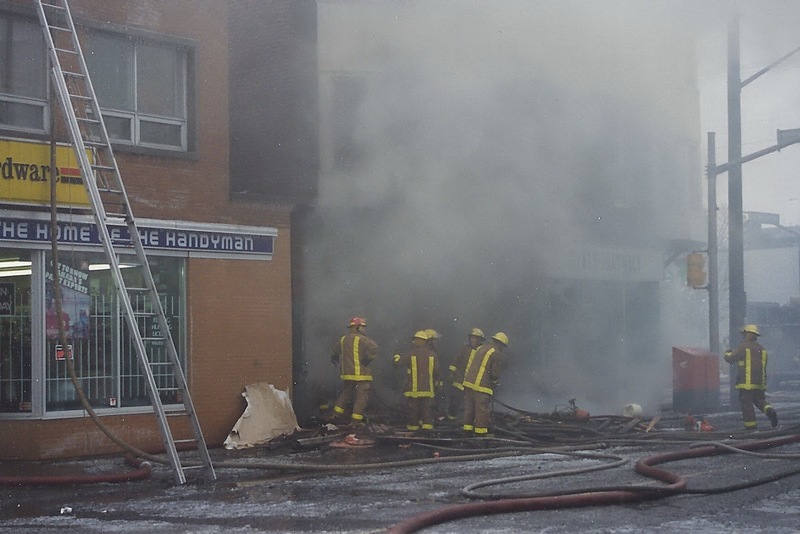 In the end, the fire ruined the roof, the floor tiles had to be replaced, and all of the merchandise had to be sold at reduced prices due to smoke damage. But thankfully, the building survived. After a substantial renovation in 1996, Home Hardware re-opened with a new feature: Sharky's Scuba Supply in the basement. Mike Morris is the owner and operator of the store, and can be seen most days in the shop. He got his start in the store at age 11, and took over for his Dad William back in 1991. He is closing in on 50 years in the store - an impressive accomplishment. William Morris can also still be found in the store from time to time. Now in his 80s, I am sure he too can look back on the impact the shop has had to the community and be proud of his family's legacy on Wellington Street West. 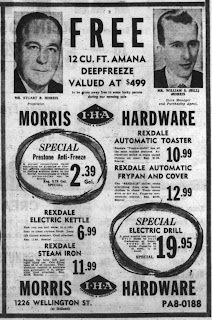 As Morris Home Hardware hits the 70-year mark in 2017, I hope this little article helps underline some of the reasons why many in the community likely appreciate this shop more than even they realize. It is handy and convenient to have a neighbourhood shop like this, and when you consider that they've survived all the way back to just about the end of WWII, that historical tie-in is important too. Though it carries the Home Hardware name, it still has the look and feel of a family-run, neighbourhood hardware shop that's a throwback to 50-60 years ago. To experience this is more than just running in to grab a can of paint or a box of nails. The business and the building itself are certainly well-appreciated landmarks that contribute greatly to the unique, eclectic Wellington Street strip that we can all be very proud of. Thx for sharing. I love shopping in our neighbourhood hardware store !!! !